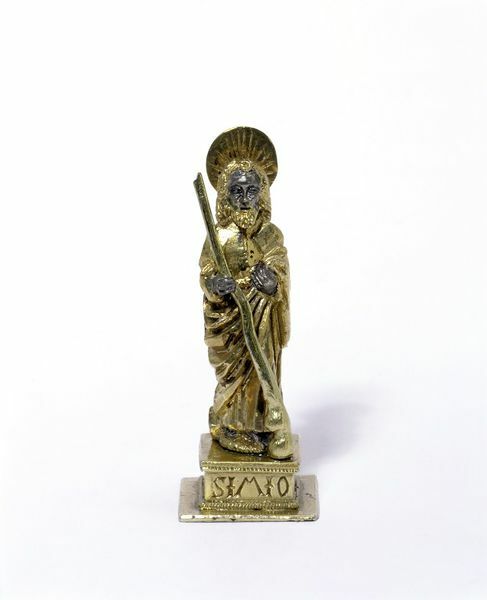 This figure marked 'SIMION' (Simon) is one of a set of 13 depicting Christ and the Apostles. They may have come from the sides of a casket, a shrine or perhaps the sides of a private altar. 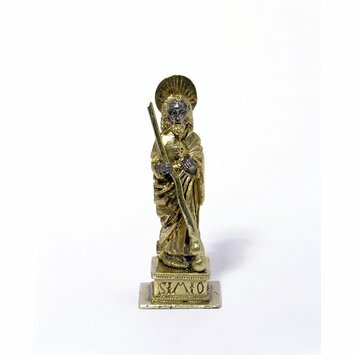 Small, cast figurines are often found on church silver, decorating processional crosses, reliquaries or chalices. Similar figures can also be found as spoon finials. Each figure holds an object which identifies him, such as a pair of keys for St Peter. Silver figures were often used in private chapels around this date. For example, the English king Henry VIII had three gold and 49 silver-gilt 'images' in the 1521 inventory of the Chapel Royal. The figures, representing Our Saviour and the twelve Apostles, are all cast solid and chased. They stand on square bases, with their names inscribed, and all have a Roman numeral scratched on them. These figures may have come from the sides of a casket, a shrine or perhaps the sides of a private altar. Small, cast figurines are often found on church silver, decorating processional crosses, reliquaries or chalices. Similar figures can also be found as spoon finials. Each figure holds an object which identifies him such as a pair of keys for St Peter.